Figure 1. 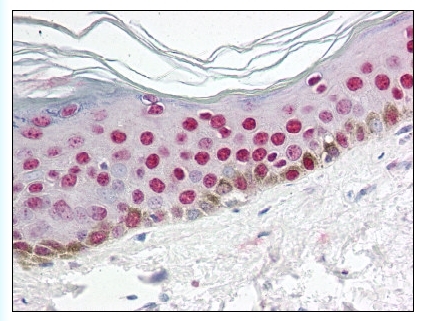 Staining UNG2 in Skin tissue by Immunohistochemistry using Formalin-Fixed Paraffin-Embedded (FFPE) tissue. Western blot analysis of CCNO in mouse bladder tissue lysate with CCNO polyclonal antibody ( Cat # PAB13205 ) at ( A ) 0.5, ( B ) 1 and ( C ) 2 µg/ml. Western blot analysis of CCNO in human bladder tissue lysate with CCNO polyclonal antibody ( Cat # PAB13206 ) at ( A ) 1 and ( B ) 2 µg/ml. Immunohistochemistry (IHC) analyzes of UDG antibody (Cat.-No. : AP20519PU-N) in paraffin-embedded human skeletal muscle tissue. 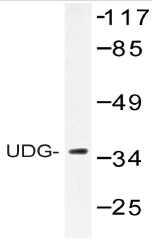 Western blot (WB) analysis of UDG antibody (Cat.-No. : AP20519PU-N) in extracts from HepG2 cells. CCNO Antibody (N-term) (Cat. 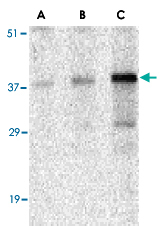 #AP50821PU-N) western blot analysis in 293 cell line lysates (35µg/lane).This demonstrates the CCNO antibody detected the CCNO protein (arrow). 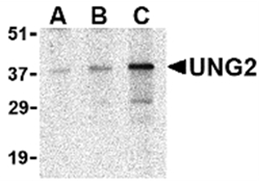 Western blot analysis of UNG2 in mouse bladder tissue lysate with UNG2 antibody at (A) 0.5, (B) 1 and (C) 2 µg/ml. 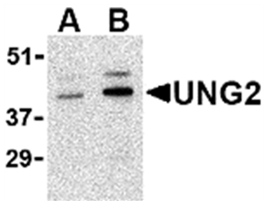 Western blot analysis of UNG2 in human bladder tissue lysate with UNG2 antibody at (A) 1 and (B) 2 µg/ml.